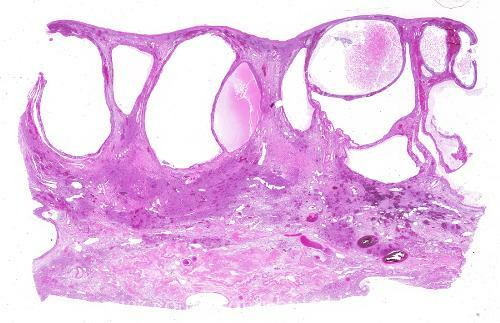 Additional Info: In this condition, the ovary is enlarged and there are numerous luteinized follicles, with luteinization of the intervening stroma. It is occasionally mistaken for a neoplasm. While it can be seen in normal pregnancies, it is associated with abnormally elevated HCG. Twin (or greater) gestations and hydatidiform moles should be excluded.